The new Continental Flying Spur is the fastest four-door in the company's history, and the fastest in the world, with a top speed of 313 km/h (195mph). It marries the excitement, power, refinement and craftsmanship of the Continental GT with enhanced luxury and space to provide a supreme combination of performance, style and comfort. The launch of the Continental Flying Spur is a further step forward in the revitalisation of Bentley, which began in 1998 with significant investment in Crewe, the company's design, engineering and manufacturing headquarters. The Continental Flying Spur was created at the state-of-the-art Crewe factory, where a 550-strong team of engineers has worked alongside Bentley's renowned designers, craftsmen and craftswomen. Access to parent company Volkswagen's worldwide engineering test facilities has also been of prime importance to the development of the car and the Continental Flying Spur has benefitted from the use of the group's advanced windtunnels, proving grounds and prototyping facilities. "The Continental Flying Spur is a brilliant example of how to match world-beating technologies with renowned craftsmanship," says Bentley chairman Dr Franz-Josef Paefgen. "It is a performance car but not at the cost of comfort and as such represents a unique proposition - a sumptuous and spacious four-door Grand Tourer with the heart and soul of a high-performance coupé." An all-new four-door Grand Tourer born of the Continental GT coupé that blends peerless Bentley craftsmanship and design with modern technologies. Inspired by the 1952 Bentley R-Type Continental and 1957 four-door Continental Flying Spur, from which the new model takes its name. Exhilarating supercar performance thanks to a top speed of 195mph (313km/h) and a 0-60mph time of 4.9 seconds (0-100km/h in 5.2 seconds). Powered by a 6-litre, twin-turbocharged, 12-cylinder engine engineered and built at Bentley's factory in Crewe. Tuned to provide not just a massive 552bhp but also the legendary Bentley wave of torque from low revs. A high-tech, all-wheel-drive system for exceptional stability and grip in any conditions is driven by an advanced six-speed automatic gearbox with paddleshift controls. The Continental Flying Spur shares the massive braking system introduced on the Continental GT coupé. The 405mm ventilated front brake discs are the largest on any production passenger car on sale today. A stunning cabin that uses exquisite Bentley design and craftsmanship to create a spacious, welcoming interior. A classic mix of leather hides and wood veneers are combined to give a contemporary but timeless appearance. 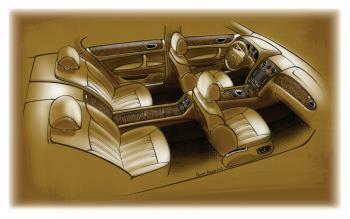 Over 11 leather hides are used to make a complete set of upholstery in the Continental Flying Spur. These are traditionally imported from northern Europe, where the relatively insect-free environment benefits leather quality. Spacious rear legroom provides total comfort for all passengers with a five or four-seat layout optional at the time of purchase. All expected technology and feature content in the Continental Flying Spur comes as standard, meaning customers only have to choose options in order to personalise their car, rather than complete it. Designed and developed in parallel with the Continental GT coupé at Bentley's design studios and engineering facilities in Crewe to ensure ultimate synergy in their visual appearance and in their on-going engineering and development programmes. 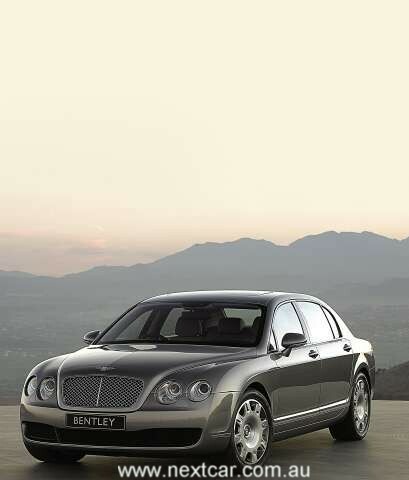 The new Bentley Continental Flying Spur will begin its global roll-out from April 2005. 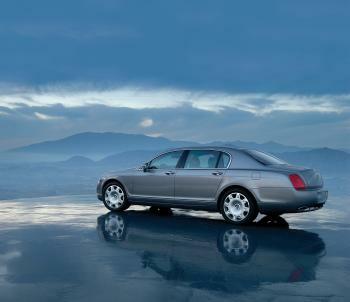 If one phrase could sum up the brief for the Continental Flying Spur concept it would be: 'no compromise'. That clear but challenging ambition meant the Continental Flying Spur would need to offer the highest levels of elegance and comfort while still delivering performance and driving dynamics normally only found in sports cars. In short it would be a sporting Grand Tourer with substantial rear legroom for passengers, a stunning interior and breathtaking cabin materials; a car capable of travelling great distances with ease while delivering immense driving pleasure - in other words, a consummate Bentley. Design director Dirk van Braeckel created the car's bold and contemporary look at exactly the same time as its sister car, the Continental GT, thereby ensuring a consistency of image and appearance between the coupé and the equally potent four-door version. "By designing both cars together, we could ensure that the Continental Flying Spur is unmistakeably related to the Continental GT," says van Braeckel. "They share presence and authority in equal measure. That means the Continental Flying Spur has a noticeably short front overhang like the GT and a broad, dominant bonnet and radiator grille. It is unmistakeably a Bentley." Where the Continental GT coupé drew inspiration from the iconic 1952 Bentley R-Type Continental, the roots of the new four-door can be seen in the equally desirable and admired 1957 four-door Continental Flying Spur; the car from which the new model takes its name. Clean, contemporary lines stand out on every surface of the new Continental Flying Spur, an effect that was a primary aim of Dirk van Braeckel and his design team, who were keen to ensure that the car was evocative, timeless and unostentatious. 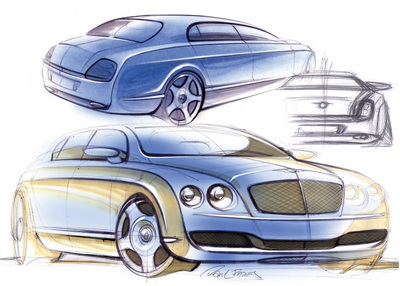 This design theme is key to the future direction of all Bentleys, one in which the past will serve as inspiration but won't dominate the end product. The Continental Flying Spur's look is intended to offer owners both individuality and understatement. "One of the virtues of the Bentley brand has always been understatement," says van Braeckel. "Even in the early days, many people preferred Bentleys to other more ostentatious cars." Where design cues have been evolved from past Bentleys, they are interpreted in a manner that befits a modern four-door Grand Tourer. Central to the Continental Flying Spur's appearance is the rounded C-pillar behind the rear doors - a motif found on many early Bentleys. This 'hockey stick' curve adds tension and sportiness to the car's profile. The extra length of the Continental Flying Spur compared to the coupé emphasises the waistline of the car, creating the impression of a deep, solid body that offers seclusion and privacy to its occupants. The elongated profile also benefits the car's aerodynamic properties, critical when a top speed of 195mph is attainable. The body of the new Continental Flying Spur is also immensely stiff (46Hz resonance frequency) for both strength and durability. "We have paid very close attention to the air flow over the car," says Bentley's head of exterior design, Raul Pires. "The rear bumper is specifically shaped to funnel air out cleanly from the underbody diffuser and the small aerofoil lip on the trailing edge of the bootlid provides downforce and stability at high speed. The four-door has an even better drag coefficient than the Continental GT - 0.31Cd compared to the coupé's 0.32Cd." Like the Continental GT coupé, the Continental Flying Spur was first designed in the computer virtual world. With all its components existing in the virtual world before a single one was created as a physical property, it was possible to see how each part interacts with all the others, highlighting problems and conflicts that might not otherwise have come to light. This process cut down development time and enabled Bentley's engineers to design in quality and consistency at a component level. Bentley also used advanced modelling techniques at the early pre-production stages to ensure that both the exterior and interior of the car were designed to astonishing levels of accuracy. Using a technique known as Data Control Modelling, precision-machined full-scale models of the inside and outside of the car were built using composite materials that are milled to within an accuracy of 0.1mm. The result is a perfect facsimile of the new car that can be used to construct extremely accurate tools for the production stage. The Continental Flying Spur's interior proportions provide luxurious legroom for all passengers and an impressive canvas on which Bentley's interior design team could set to work. Throughout the interior, leather hides or wood veneers on every surface combine to give a welcoming and contemporary environment for the driver and passengers alike. Inspiration for key elements of the Continental Flying Spur's interior came from earlier Bentleys. A deep, generous wooden waistrail runs the length of the cabin, producing a feeling of cossetting protection and opulence. Deep waistrails are very much part of Bentley tradition stemming back to the 8-litre Bentleys of the 1930s. "The use of so much prominent wood is a really distinguishing factor for any Bentley," says Henrik Nordin, interior designer. "We have managed to build this into the Continental Flying Spur but without making it feel dated or retro. Instead it feels elegant, sumptuous and subtly sporting, which is exactly the sort of statement this car should make." Naturally, wood veneers and leather hides remain an integral part of the Bentley furniture, but they have been tailored to suit the Continental Flying Spur, proving that these most traditional materials can still convey a contemporary feel. Though craftsmanship remains as important as ever, these enduring skills have been complemented by some 21st century technology allowing, for instance, wood veneer to be dramatically curved in a way that would simply not have been possible in the past. And while the hide is still applied to the car with as much loving care as ever, it is cut using a digitised process that ensures minimal levels of wastage and optimum quality levels. Throughout the car small but ingenious design touches highlight the difference between a Bentley and a conventional luxury saloon. The front seat headrests, for example, have been kept as small as possible to allow passengers in the rear an unobstructed view out. Even the areas behind the interior door levers and grab handles are protected by a stylish metal plate that prevents rings on fingers damaging the precious leather lining. Burr walnut unbleached premium wood veneer is applied to the facia, front and rear consoles and waistrails. A choice of four further veneers is available as an optional extra. Premium leather hides cover the seating, door panels, waistrails, dashboard, rear parcel shelf, roof headlining (and outer side panels of the rear console on four-seat models). Hide-trimmed multi-function steering wheel and chrome-trimmed gear selector. Veneers are cut using the latest laser technology. They are then lacquered by hand before being machined and polished. The veneer is, as with all Bentleys, book and mirror-matched to create perfect symmetry, with one side exactly reflecting the other. Bentley is unique among car makers in using natural, unstained and unbleached veneers. A complete set of upholstery is made up of more than 11 hides. The finest leather hides are imported from Northern Europe because insects that can damage the quality of the finished leather don't like colder climates. It takes approximately five hours to trim a steering wheel. The steering wheel is double-stitched by hand using two needles simultaneously. 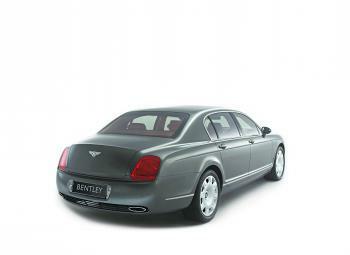 Classic Bentley brightwork decorates the Continental Flying Spur. Iconic symbols such as the 'Winged B' badge and the matrix grille grace the exterior, while bulls-eye ventilation outlets with their organ stop controls sit alongside unique chrome knurled switchgear that was inspired by blending contemporary jewellery with switches from vintage Bentleys. Continental Flying Spur owners will want for nothing inside their car, whether behind the wheel or enjoying the ride as a passenger. The car is equipped with the latest advanced cabin technology from its power-latching doors and 16-way electrically powered front seats (that are also air-cooled and heated) with new electro-mechanical lumbar control, to its four-zone climate control, LED mood lighting and advanced infotainment system. Whether specified as a four-seat model with a centre console between two electrically powered rear seats or the five-seat cabin with full-width rear seat, passengers will experience an environment that simply cannot be found in any other car. The four-seat option cradles its rear occupants in large, sculpted seats that are electrically adjustable for optimum comfort. These seats are divided by a centre console which is trimmed in premium leather hide and wood veneer and contains the seat and climate control systems as well as a beautifully designed ashtray alongside a cupholder and storage space. Passengers in the rear can also operate the chair of the front-seat passenger, thereby ensuring maximum legroom and comfort should the front be unoccupied. Five-seat configuration as standard with full-width rear seat. Optional four-seater configuration with two individual rear seats and centre console with stowage, rear climate control functions and seat switches. Innovative multi-function storage area in centre console of four-seater model, containing unique removable designer ashtray. 16-way electrically adjustable front seats incorporating climate control, three-position memory (seats, steering column, exterior mirrors) and electric lumbar control with massage facility. Rear outer seat positions on five-seat model incorporate climate control, heating and electro-mechanical lumbar adjustment. Rear centre armrest with lockable ski hatch. Multi-zone electronic climate control system. Computerised suspension control operation (damper and ride height settings). 6-CD auto changer in glove compartment. Nokia 'docking station' system for in-car phone (except for Japanese market). Bluetooth hands-free privacy handset in centre arm rest as a no-cost option (except for Japanese market). Keyless entry and keyless ignition system (US market - keyless entry only). Electronic park brake with move-off assist (except for US market). Stainless steel-faced foot pedals and driver's foot rest. Optional glass electric tilt-slide sunroof (non-cost option for US market). The Continental Flying Spur combines the finest Bentley traditions and craftsmanship with highly advanced automotive technology. Wherever modern solutions have been introduced on the car, however, these are never to the detriment of driving enjoyment or passenger comfort. At Bentley we don't believe in overloading our cars, or our customers, with technology that they don't need or may never use. 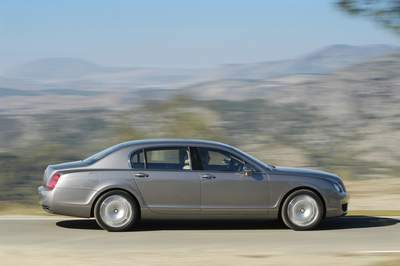 On the Continental Flying Spur every feature content or safety system must make a case for itself before being added. The result is a car that contains a host of practical and desirable features that complement rather than overshadow the unique character of the Continental Flying Spur. What's more, the full features list is almost entirely standard, meaning customers won't be forced to trawl through an exhausting options list at additional cost. Whether you opt for the four or five-seat version, the Continental Flying Spur's full range of technology and feature content will be available to all. Unique LED bulbless lamps to rear. Rear spoiler styled into bootlid operates in conjunction with underbody diffuser to provide enhanced high-speed stability, contributing to a low drag coefficient of 0.31Cd. Traditional Bentley twin oval stainless steel exhaust finishers. Choice of 16 exterior paint colours. Full infra-red laminated glazing to all windows (dependent on market). "All Bentleys must be able to pamper and perform when called upon. In the Continental Flying Spur you can be cruising along enjoying the highest comfort and luxury with superb ride quality. Then all you need to do is press the accelerator and the car is transformed. That is the character of the Continental GT coupé and one of our engineering challenges was to keep the family characteristics that people admire so much." To ensure that the entire Bentley Continental range shared those qualities it was essential that both models had the right building blocks. The basis of the cars is an exceptionally stiff steel chassis and by extending the wheelbase of the Continental Flying Spur by 300mm (12 inches) the design team ensured the car had the spacious rear legroom that was a key objective. The body of the new Continental Flying Spur is immensely stiff (46Hz resonance frequency) and this provides an extremely stable platform for the suspension and steering components for optimum on-road performance. Redesigned electronic dampers within the air spring units ensure a suitable blend of sportiness and refinement. New suspension bushes and reconfigured software are also introduced to complement the revised dampers. A new aluminium subframe at the rear provides a light, stiff and strong platform for the multi-link rear suspension. New aluminium uprights at the front lower the unsprung weight of the car and consequently improve all-round steering feel and rolling comfort. "By adjusting the suspension to control the car's height we can constantly ensure the optimum level of ride refinement. The other major advantage is that we can use the air suspension to change the attitude of the car at higher speeds to improve stability. We have programmed the Continental Flying Spur's suspension to lower the nose by 10mm and the rear end by 25mm at speeds over 155mph (250km/h). This reduces rear end lift at high velocities and means our car feels very stable, rather than nervous, as your speed increases." Thanks to a continuous all-wheel drive system, the Continental Flying Spur is blessed with astonishing traction and poise whatever the weather. In standard conditions the drive is transferred equally between the front and rear axles via a highly sensitive centre Torsen differential. If, however, the differential detects a deviation in torque demand between the two axles it automatically sends more power to the wheels indicating greater grip. As well as its advanced all-wheel drive system, the Continental Flying Spur incorporates traction control and an Electronic Stability Programme (ESP), both of which can be disabled at the discretion of the driver. These driver aids operate discreetly, offering additional security and governance over the car's dynamic potential but without being intrusive, thereby ensuring the unique Bentley driving experience remains undisturbed. The advanced technologies used in the Continental Flying Spur's suspension were rigorously tested on proving grounds, test tracks and roads across the world. The result is a car whose breadth and capability, in any weather, on any road surface, is simply awesome. Over the course of its development the car was subjected to a drive programme that saw it complete nearly a million miles. "When it came to prototype driving and development we utilised the finest facilities all around the world," says Dr Ulrich Eichhorn, member of the board, engineering. "The car was extensively tested at internationally recognised venues such as the Nürburgring, Nardo and the Grossglockner mountain pass. We also adopted some new development processes that married tried and tested practices with Bentley specifics. The result is a car that has been developed to the highest possible standards." Evidence of this thorough testing process is seen in the Continental Flying Spur's revised steering. To ensure that the car handles in a way that is suitable for a luxury saloon as well as a high-performance grand tourer, a new steering rack was engineered. To improve driver feel friction was reduced in the steering column, rack and suspension ball joints. The system's responsiveness was also adapted to suit a four-door grand tourer, with a slightly lighter weighting around the centre for more relaxed driving at high speeds and a more linear increase in loading as it begins to corner. The new rack also means the Continental Flying Spur has a highly competitive 11.8-metre turning circle kerb-to-kerb - an impressive figure for a car with such generous accommodation. Wheel and tyre choice is a vital part of the handling and dynamic characteristics of the Continental Flying Spur. The car will come with single-piece 19-inch alloy wheels as standard and will run on bespoke 275/40 R19 tyres produced by Pirelli and Michelin. A final visual aid to help create that unmistakeable sporting presence is an optional 20-inch two-piece alloy sports wheel. This seven-spoke rim has a combination of chrome and silk finishes and retains the distinctive 'Bentley Motors' hub. The new two-piece sports wheel also wears a brand new tyre created exclusively for the larger rim and recently introduced as part of the Continental GT's optional Mulliner Driving Specification. Designed on behalf of Bentley by Yokohama, the Advan Sport 275/35 R20 tyre provides significant benefits for drivers looking for even sportier handling and improved steering feel and response. The culmination of an intensive development programme carried out by both Bentley and Yokohama engineers, the new tyre has a lower sidewall that provides sharper turn-in feel and precision. The Yokohama Advan Sport manages to deliver increased performance without noticeable reduction in overall ride quality, meaning drivers will continue to enjoy the unparalleled luxury of the Continental Flying Spur and now benefit from its increased sporting characteristics. Braking is provided by huge ventilated disc brakes - the largest of any production passenger car on sale today. The front discs are 405mm in diameter and 36mm wide, and the rear discs 335mm in diameter and 22mm wide. These are retarded by aluminium single-sided callipers branded with cast aluminium 'Bentley' logos. The braking system features a Bosch anti-lock system with Brake Assist and electronic pressure distribution. The Continental Flying Spur also has a unique electronic parking brake - after the driver has applied the brake it will automatically re-apply one and five minutes later. This prevents accidental slippage should the brake discs cool after use. The parking brake system can also be operated as an emergency brake. In this instance braking is applied to all four wheels and the car's electronic safety systems remain fully operational allowing the driver to steer as normal. The Continental Flying Spur also offers enhanced occupant safety with the use of a tyre-pressure monitoring system that constantly measures the tyre pressures in all four wheels and instantly warns the driver should a significant reduction occur. The heart of the Continental Flying Spur is its magnificent 6.0-litre, twin-turbocharged 12-cylinder engine which will propel the car to 60mph in 4.9 seconds and on to a top speed of 195mph. This awe-inspiring piece of engineering was created for both the coupé and four-door versions of the Continental and delivers phenomenal power (552bhp/411kW) as well as that legendary wave of torque (479lb ft/650Nm) from low revs that is the hallmark of every Bentley. "When the decision was taken to produce the Continental family, we knew we would need an engine that was incredibly compact and well packaged to incorporate both its styling requirements and complex powertrain," reveals Dr Ulrich Eichhorn, member of the board, engineering. "From the outset the W12 concept was created with all the group's top products in mind. That is why we had significant input into the basic architecture of the engine. This basis was then developed extensively by Bentley to meet our exacting requirements - high torque at low revs and effortless acceleration." "The engine block is made from a hypereutectic aluminium alloy with silicon concentrates that reduce friction in the cylinder bores. Aluminium pistons were also specially developed to cope with the increase forces created by the turbochargers, which were themselves created exclusively for this Bentley engine." The 12-cylinder block has a 48-valve head with four camshafts that operate using continually variable valve-timing. Power is transmitted via a seven-bearing crankshaft to the car's six-speed automatic transmission. To ensure that the large powerplant met stringent Euro IV and US LEV emissions regulations the twin turbochargers were designed with a unique bypass valve that automatically sends exhaust gases to heat the catalytic convertors when the car is started from cold. This valve then operates as the turbocharger wastegate at all other times. The Borg-Warner turbochargers are also the ideal solution for producing the flat torque curve that is a key characteristic of every Bentley engine, ensuring that the driver has instantly available performance without a hint of turbo lag or having to shift down through the gears. That mighty torque curve is constant, with no drop-off from its maximum output of 479lb ft (650Nm) at just 1600rpm. Packaging all those systems was a remarkable challenge in itself. The astonishing compactness of the engine - it is just 653mm long - was a critical target and with such immense amounts of torque it was equally imperative to have impressive traction in any conditions. What was called for was an all-wheel drive system that could cope with the Continental Flying Spur's performance capability and consequently as short an engine as possible to allow room for the extra componentry. "The internal packaging of the engine is amazing," says Francis Ellison, module leader, powertrain. "And that helped when it came to designing all the other elements of the car's powertrain assembly. Because of the performance requirements, we wanted the centre of gravity to remain as low as possible and this meant we couldn't have the front differential under the engine. Instead we placed it between the engine and the gearbox. You can only do that if you have a very compact engine to begin with, otherwise you would have a car with a very long nose." With ideal positioning of the main parts of the powertrain, the Continental Flying Spur has a 56:44 weight distribution over the front and rear axles. Unlike rear-wheel drive cars with large amounts of power, which are forced to put more weight over the rear wheels to improve traction, the Bentley's all-wheel drive system means the weight balance can be biased towards the front, thereby improving both the agility and handling of the car. "Because we have a close to ideal distribution of weight, the Continental Flying Spur has excellent initial grip and turn-in when you start cornering," says Dr Ulrich Eichhorn. "You also get very good high-speed stability and it is much easier to tune an inherently stable chassis like ours to be agile than to make a nervous one stable." Work was not just carried out on the performance capabilities of the engine but also its acoustic properties. The Continental Flying Spur has a re-engineered exhaust system that provides greater refinement for a car that has a broader role than the coupé. "We have added a cross-tube in the centre of the exhaust system and we have also optimised the exhaust valve system to get the right acoustic pattern," explains Cameron Paterson, head of engineering for the Continental Flying Spur. "The exhaust note in the Continental GT coupé was deliberately quite noticeable - it is a sports car after all. For the Continental Flying Spur we wanted to ensure more refinement when you are driving in a leisurely fashion but still create that unmistakeable Bentley sound when you are pressing on. With this new exhaust system we can achieve that by closing off one tailpipe at differing engine load levels." The Continental Flying Spur's prodigious power is channelled through a six-speed automatic transmission built for Bentley by ZF. This is the same gearbox as used in the coupé but it has been recalibrated. The principle behind the reworked transmission is to give a more relaxed driving style but to retain the car's full performance when called upon. At most times the transmission will rely on the enormous torque produced by the engine to do more of the propulsion, thereby avoiding unnecessary downshifting and allowing the driver to enjoy the tremendous pulling power of the engine as well as giving a smoother driving experience. However, the driver will always be just a push of the accelerator away from instantaneous response and the car's full potential. The ability of the gearbox to lock its torque converter during normal driving conditions replicates the immediacy of a manual transmission but without sacrificing any of the smoothness of an automatic gearbox. The six-speed transmission can be left in full automatic mode or changed to a Tiptronic function that allows it to be used as a clutchless manual where gear changes take place only on the command of the driver, via either the gearlever or paddles mounted behind the steering wheel. Naturally the transmission constantly monitors the engine speeds and selected ratios to ensure that it is not possible to over-rev the engine when changing down in tiptronic mode or stall the car by slowing too much in a high gear. These subtle but essential points sum up the character of this remarkable car. From a sound basic concept was devised a four-door grand tourer that delivers on every front. "Our job was to ensure that the car was exceptionally sporting and stable yet still refined and luxurious," says Dr Ulrich Eichhorn. "I always tell my teams that it is the concept that defines the potential but the detailed execution determines the result." The increase in wheelbase over the Continental GT coupé means the Continental Flying Spur will react differently to the physical forces created in the event of an accident. The change in what is known as its 'crash pulse' means it has a revised crash structure between the engine and front bumper. To ensure the highest possible protection in the event of a head-on crash the car was subjected to a series of advanced simulated crashes on a super-computer as well as more standard real world tests. Bentley's advanced Dynamic Crash Analysis (DCA) capability means much of the trial and error traditionally associated with providing a car with good impact resistance has been bypassed. Indeed, so highly developed are the procedures that Bentley's engineers can put the Continental Flying Spur through a real world crash test with great confidence that the result will vary in no major way from those predicted in the virtual world. Nevertheless it should be understood that DCA, as with all virtual design work, will never replace real world test procedures, nor was it ever designed to. Its role is simply to ensure that by the time these tests are conducted, the product is in as good a shape as possible to meet each new challenge. To protect its occupants, the Continental Flying Spur is equipped with a full suite of safety equipment. There are two front airbags, four side thorax airbags for the front and rear-seats and full-length curtain bags that extend to the back of the cabin. Seat-belt pre-tensioners are used for all seats and a passenger occupant sensing system in the rear seats automatically raises the rear headrests to ensure the best possible protection against whiplash injuries. It's not just the range of safety systems that protect the car's occupants, for the Continental Flying Spur's all-round abilities mean the driver is assured of having the performance to avoid many accidents in the first place. The all-wheel drive system offers major safety advantages not only in adverse road and weather conditions, while the latest traction, stability and brake control systems offer further opportunities to avert potential danger. Similarly the powerful 6.0-litre engine means outstandingly fast acceleration and a reduction in the time spent on the wrong side of the road during overtaking. To this end, the Continental Flying Spur is specified like no other four-door in the world. 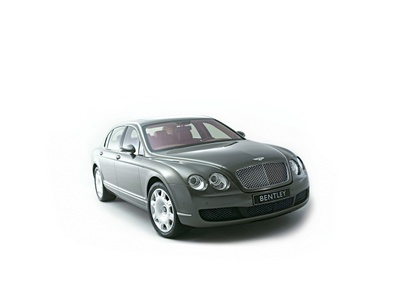 The Continental Flying Spur perfectly complements the existing range of Bentley models. The Continental GT continues to fulfil our customers' desire for a dynamic coupé that offers the very essence of Bentley: sporting prowess and Grand Touring performance. Similarly the Arnage range represents a unique proposition: the emotional purchase of a truly bespoke, hand-built and entirely individual limousine. The Continental Flying Spur will appeal to customers seeking a sumptuous four-door Grand Tourer sharing all the virtues of its coupé stablemate: high-performance, timeless design and superb craftsmanship. "As Continental Flying Spur production begins, the Arnage will retain its true position as the most exclusive limousine in the world. If you work in a major capital city you might see a Continental Flying Spur a few times a month, but you will only come across an Arnage a few times a year. The Arnage will continue to be a bespoke car with real exclusivity." "With the Continental Flying Spur we are opening our doors to new customers who value that unique combination of luxury, style, excitement and practicality. Nowhere else will they be able to enjoy a car that possesses all this as well as the dynamic qualities and power of the Continental GT coupé. The Continental Flying Spur promises a new motoring experience and we look forward to welcoming a new breed of discerning customers to our marque." "We know there is a great market for a car like this. Like the original Flying Spur, the new Bentley is also purposely positioned as a premium product above a crowded market. When asking our future customers about their needs they were very clear - performance and luxury, style and practicality, inspiration and solidity, excitement and safety. The Continental Flying Spur is our response to their 'no compromise' attitude, and our desire to further the Bentley story." Bentley is confident that although the production of the new Continental Flying Spur will naturally increase annual sales volumes, the exclusivity of marque's brand will be retained - a factor that has been crucial to its mystique since its beginning in 1919. In the 85 years since, the marque has built a heritage and authenticity based upon its understanding of its customers and the passion for what it does. Whether competing at Le Mans, creating bespoke cars for loyal clients, or introducing new members to the exclusive Bentley family, it has always been done in a manner that echoes the spirit of its founder W.O. Bentley. To that purpose, every Bentley customer will still experience the most personal treatment from his local dealer right up to the factory gates at Crewe where they can come and watch their car being built. The introduction of the Continental Flying Spur marks the next step in the revival of Britain's most revered automotive marque. Following on from the hugely successful launch of its sister car, the Continental GT coupé, this stunning new car will change people's perceptions of what performance, comfort and style from a four-door grand tourer means. And the unveiling of the Continental Flying Spur is not the end of the story. Bentley remains committed to a thrilling future model programme, one that will reflect the core values of the company, ensuring its public perception is not diluted by over-production or unnecessary niche products. "The purity of our brand is in clear focus now," says Adrian Hallmark, member of the board, marketing. "We can behave as an independent company because the economics of our business plan are sound and we don't have to compromise our products because of short-term financial decisions. We are that rare thing in the British automotive world - a car company that is expanding and we have done so by producing models that appeal to a demanding and growing customer group. "Our aim is to restore Bentley to the position it once owned - the creator of definitive British Grand Tourers - and the Continental Flying Spur is our next step in the fulfilment of that ambition."